Beyoncé is the most radical and dynamic pop performer of our lifetime. We've known this for a while. It was highlighted, bolded, and underlined in the cinematic and highly lauded Lemonade album, in which she crushed the powers that be (the institution of marriage, the carceral state, the patriarchy) to a pulp. In 2017, she was scheduled to perform at the Coachella Valley Music and Arts Festival, but had to postpone it by a year after revealing her pregnancy. Fans had two years to speculate what her 105-minute performance would entail – and it was every bit worth the wait. On stage, like a Roman fable but channelling Nefertiti, the 36-year-old singer catwalked out in a golden garment to a crowd of 125,000 attendees. On the back of her cape, the bedazzled insignia “BΔK (Beyoncé Delta Knowles)” glinted to the cameras. Surrounding her were dancers outfitted in Egyptian themed-bodysuits, sprinkled with Black Panther accessories. As she prepared for the opener "Crazy In Love," a marching band in all-yellow sweatshirts appeared on a staircase tower behind her, resembling the pyramids of Giza, or more fittingly, a hornets nest ready to swarm the Empire Polo Grounds. There’s untold power in this image. The night before her performance, Californian rapper Vince Staples called the main stage the “white people stage” in reference to the festival’s bounty of white indie rockers. Olivier Rousteing, the creative director of French fashion house Balmain, told Vogue that he was approached to create the looks for the show about survivors and militarism. The language of Egyptian aesthetics is common in American hip hop as a projection of strength and resilience – Nas completed an album trilogy with a cover art depicting himself as a King Tutankhamun superimposed over a backdrop of a New York City housing project. He signified to his audience that he had reached the apex of self-fulfilment, but also acknowledged his native soil. In a similar move, Rakim called himself a “Pharaoh in Ghetto apparel” in 2009’s “Holy Are You”. 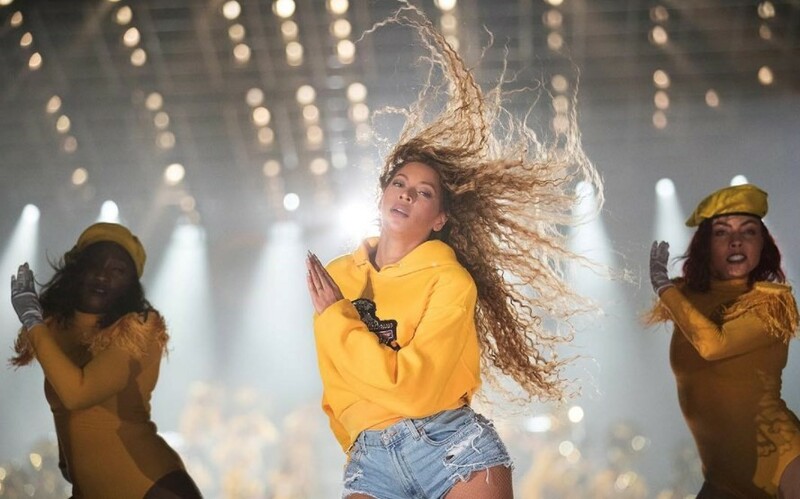 Midway through Beyoncé’s masterpiece, she made a quick wardrobe change into cut-off shorts and a collegiate sweatshirt (bedazzled with “BΔK”, again), as she engulfed the mainstage with over a hundred young black band members and herself as the braggadocious leader. During “Diva”, the pop track exploded into a thunderous step dance routine. There were plenty of epic dance moments, but none compared to Beyoncé and her sister Solange reenacting the call-and-response portion of “Get Me Bodied” to a T.
The performance was historic for much more than her technical abilities. Considering how grand the stage was, in diameter and symbolism, the pop polymath called upon only a handful of celebrities to support her (least interesting being Jay-Z). The much-rumoured Destiny's Child reunion materialised with a whopping three songs, including the rarely performed "Say My Name (Timbaland Remix)". The most exciting features however, came from just beyond the frame. Smuggled in every interlude and vocal leap, Beyoncé challenged us to remember what song was just strategically placed for ten seconds. "I'm a Hustla" by Cassidy and Fast Life Yungstaz’s "Swag Surfin” occupied portions of “Crazy In Love” and “Drunk In Love” respectively, with the latter morphing into Nina Simone’s “Lilac Wine”. Oblique sonic arrangements like these sketched an alternative timeline of black music, where the cadence of party rap could sit comfortably and honorably next to its highbrow equivalents. Beyoncé’s mission was to leave Indio, California having given a shout-out of epic proportion to all the characteristics of black culture and black history that continue to inspire her. The commingling of wardrobe and sounds was an ode to historically black colleges and universities; their marching bands, and black sororities and fraternities. Houston, Texas, her birthplace, is home to two historic HBCUs – Texas Southern and Prairie View A&M. Beyoncé recognises the resilience and political statement of a black college in a racially tense climate, and was determined to support them on a global stage.